I only started eating ox tongue a few years ago when I had Japanese BBQ at Torimatsu. After that meal, I fell in love with the slightly chewy, crunchy and fragrant meat that many people probably wouldn’t touch. It’s not an easy meat to prepare but it’s quite cheap compared to other meats. I used to buy them for $4-5 each at good butchers and recently they were around $5-6 each. Not too bad if you ask me for the amount of enjoyment I get out of it. Have you ever seen a tongue un-skinned? It’s not a pretty sight. Yuye used to skin the tongue himself which took about half hour each and was a very tedious task. Now we’ve found a store in Springvale that skins the tongue for us at an extra $1 per tongue. It’s a good deal! 1. Freeze tongue for a few hours until roughly 80% frozen. It needs to be firm but not too hard so you can still get your knife through. 2. Slice all the skin off with a sharp knife, don’t be afraid to waste a bit of meat on it. The part that can be eaten is the fatty upper tongue part. The fattier it looks, the more tender it would be when cooked. 3. The skinned non-fatty parts (ie. 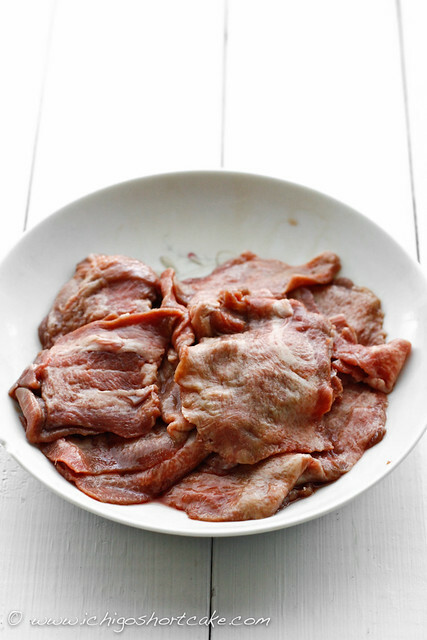 the tip of the tongue and side parts that are not fatty) can be used in stews. 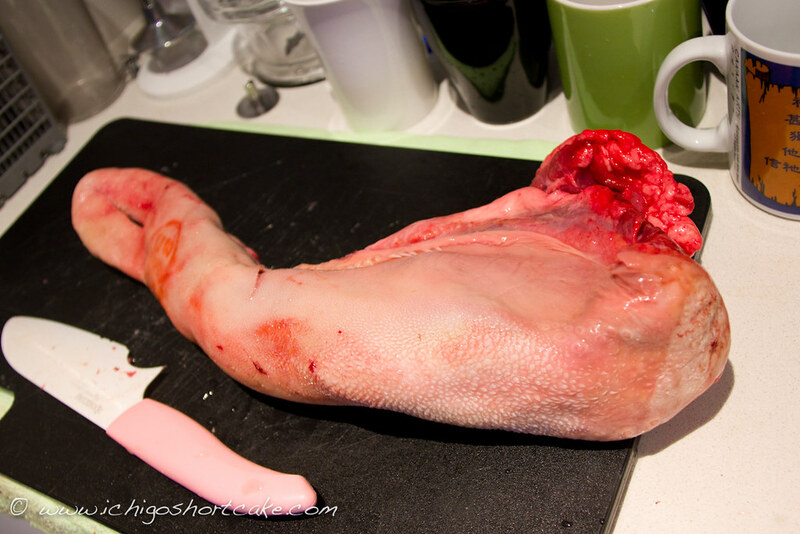 The tongue also needs to be around 80% frozen to be able to cut into thin pieces after it’s skinned. Yuye used to cut this by hand but I convinced him to cut it with our meat slicer which is a lot easier and less time consuming. 4. 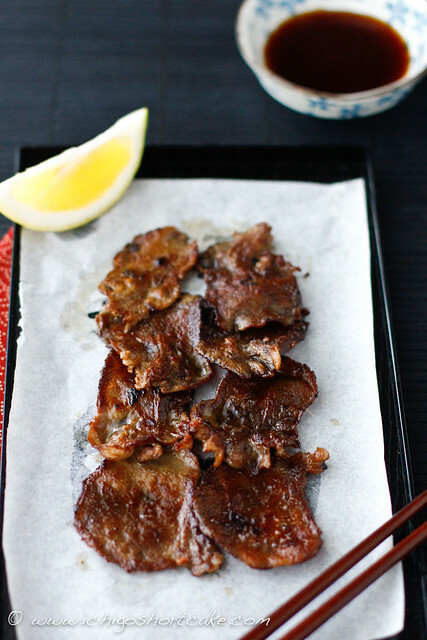 Pour ponzu sauce into a small bowl, add squeeze of lemon in the sauce or on the ox tongue pieces, serve immediately. *Ponzu sauce is a Japanese dipping sauce which contains soy sauce and yuzu (a type of citrus fruit). This sauce can be purchased from all good Asian grocery stores. 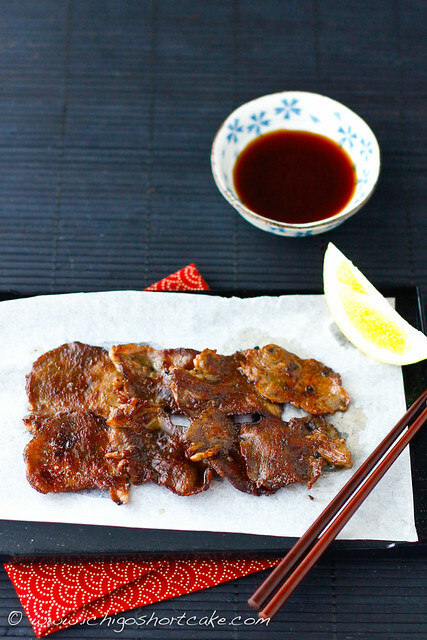 If the sauce can’t be obtained, you can substitute it with a mix of soy sauce and lemon juice. Question time: Are you a fan of trying obscure foods and have you ever tried ox tongue? Did you like it? Quick & easy beef pastries + move to WordPress! Porterhouse steak with mushroom & red wine gravy and an exciting announcement! @batasan, horhorhor…nah we ate the leftovers from the ones we couldn't fit into the boxes. We froze those boxes we took to Tom's. 😛 Just waiting for the next party! 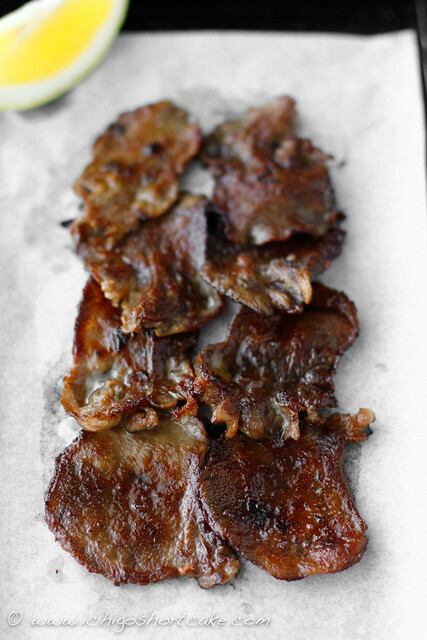 I had to say, I'm not a fan of ox tongue purely because it's… ox tongue. I think I once ate some accidentally and freaked out. I think I like obscure food combinations when it doesn't include offal. I love tongue. I never make it at home, but I regularly order it at Mexican and Korean restaurants. I used to eat tongue sandwiches when I was little too. My grandma called tongue "easy meat" since you didn't need help to eat it. I tried it once, and the flavour and texture were nice, but I got grossed out at the thought of pashing an ox, lol. Holly crap. I've been eating gyutan (that's how we call it) for many years BUT never seen the tongue itself…. I am in shock!! It's delicious though… I can't cut the meat myself FOR SURE. You are SUPER brave!!!! @Nic, cutting is quite hard if you don't have a slicer and have to do the skinning by hand as well…I'm so glad we found a butcher that can skin it for us! @Nami, I normally call it gyutan too 😛 But changed it just for the blog so it's easier to undertand, hehe..we didn't have a choice at the start because we didn't know we could get it skinned!